Despite some uncertainty, it looks like House of Cards season 6 will move forward in some form or another. The series has been on hiatus ever since Kevin Spacey was fired by Netflix, following the news of several sexual misconduct allegations. 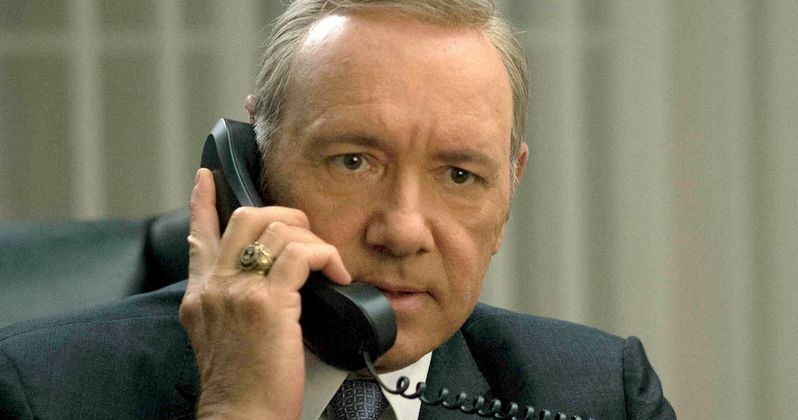 However, Pauline Micelli, Senior Vice President of Media Rights Capital, the production company behind House of Cards, recently wrote a letter to the staff, indicating that they hope to return to production soon. "As we move into the holidays, we want to express our appreciation for all of the meaningful messages of support we have received from you and want to update all of our loyal cast and crew on our progress and where things currently stand. We continue to work with Netflix with the hope of resuming production soon. As we continue these discussions, we have determined together that the crew will be paid for an additional two week hiatus, beginning on November 27th and continuing through December 8th." Netflix severed all ties with Kevin Spacey following sexual misconduct allegations from actor Anthony Rapp, as well as several who worked with him on House of Cards. The streaming service even scrapped a movie they had already filmed with Spacey. In her letter, Pauline Micelli also says that the hope is for all of the crew working on the show to return. Though, the hiatus has likely forced some to have to find other work to fill the void. "In addition to the writers, there will be a small contingency of office/accounting staff who will remain in the production office on a continuous basis. Our hope is that the entire crew will be able to reconvene when production resumes, but we want you to know that we will certainly understand if crew members need to find other work in the interim, which will prevent them from re-joining us. We sincerely appreciate all you have done. Cast and other union members who are not actively working will be paid in accordance with applicable union guidelines through this period and we will be reaching out directly to your representatives to work through the details; we will get to everyone as quickly as possible and appreciate all of your patience here." House of Cards was one of the first shows that put Netflix on the map, in terms of original programming. Kevin Spacey's Frank Underwood has been the main focus of the show through five seasons, but the writers and creative team have been working to write him out of the potential season 6. Netflix will have final say on whether or not to move forward with House of Cards season 6 once the new direction is determined. Pauline Micelli added that the show is "bigger than just one person." "These last two months have tested and tried all of us in ways none of us could have foreseen. The one thing we have learned throughout this process is that this production is bigger than just one person and we could not be more proud to be associated with one of the most loyal and talented production cast and crews in this business." These sexual harassment scandals that have rocked Hollywood as of late, which began with Harvey Weinstein and have since snowballed to reveal a much larger problem, have affected many other actors and those working in the business. Many actors and crew members depend on House of Cards and, thanks to Kevin Spacey's alleged behavior, those jobs were put in jeopardy. The letter from Pauline Micelli, courtesy of Deadline, reveals that things are looking up, after a rough period of uncertainty. It's also promised that another update will be provided by December 8 and we'll be sure to keep you up to date as more information is made available.